The Sans™ typeface family is a humanist sans serif font that is part of a larger family of fonts designed by Berlin, Germany based designer Lucas de Groot. 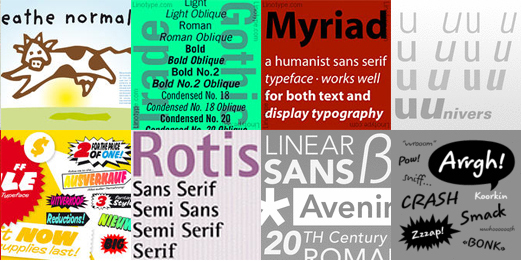 Since its inception in 1994, The Sans design has grown to have a large following, and is thought to be one of the most widely used sans serif typefaces on the planet. The Sans design is part of the Thesis family, which is regarded by many people as the most comprehensive typeface family ever produced. 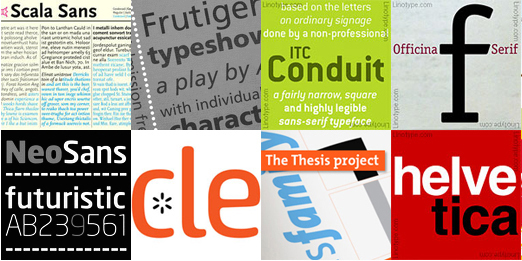 Along with two counterparts – The Serif™ and The Mix™, the Thesis typeface family is made up of 144 separate fonts, each family in the trilogy has eight weights and each weight has six variants. The Sans typeface family is ideal for use both in print and digitally, on-screen. From corporate print and design to national ad campaigns, this font is adaptable to a large number of media applications, including websites and mobile text for a number of handheld devices. It has been adopted by large corporations and organizations around the world such as AOL (America Online), Spain’s major cell phone provider Movistar, North American mobile phone provider Sprint Nextel. The Dutch roadside assistance organization ANWB also uses The Sans design as its official corporate typeface. This entry was posted in Font Highlight and tagged alt.TYPE, alttype, Corporate typeface, fonts, logo font, Lucas Fonts, singapore, The Sans, Thesis on October 24, 2012 by alt.TYPE. Fonts from the Fontfont and Linotype Libraries: Scala Sans, Frutiger, ITC Conduit, ITC Officina Sans, FF Providence, Trade Gothic, Myriad, Univers., Neo Sans, Akko, Thesis, Helvetica, FF Sale, Rotis, Avenir, Koorkin. This entry was posted in Font Highlight and tagged Akko, alt.TYPE, alt.TYPE. alttype, Avenir, cala Sans, FF Providence, FF Sale, Fontfont, Frutiger, Helvetica, ITC Conduit, ITC Officina Sans, Koorkin., Linotype, Myriad, Rotis, singapore, Thesis, Trade Gothic, Univers. From bottom left: Neo Sans on October 9, 2012 by alt.TYPE.